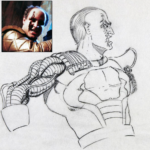 Not only was one of the #GIJoe Legends likeness used to design #Cesspool he was also part of the commercial shoot for the Toxo-Lab! Unfortunately his scene was cut from the final commercial. Attend #HASCON and ask him what it was like to be involved in the commercial shoot and portrayed as this evil villain! Hasbro HasCon is right around the corner. Will you be attending? Sound off after the break! Cesspool was the Chief Executive Officer of a huge multi-national corporation with vast holdings in oil refineries, chemical plants, and mills. In a effort to placate environmental groups, he took them on a tour through one of his chemical plants, where an accidental exposure to the toxic waste left him horrible disfigured. For reparations, he took his knowledge of high-level dirty dealings and corporate subterfuge straight to the Cobra Organization. He soon created a weapons grade Plasma Tox and portable dispersal system. However, he found the long term exposure turned some of his men into uncontrollable creatures. He was eventually caught by the G.I. Joe Team and incarcerated for many years. Cesspool secretly plotted to find ways to get back at society, and discover an additive that would let him control exposed personnel. Upon his release, he went directly back to where his experiments left off. 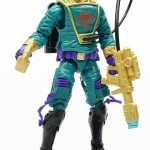 He now oversees all chemical engineering and custom synthesis of Compound Z at Cobra laboratories. Anyone exposed to this chemical becomes a zombie-like drone. he plans to create an army of Zombie Vipers and exact his revenge on the world.